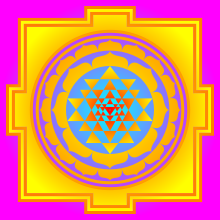 Yantra is the Sanskrit word for a mystical diagram, especially diagrams or amulets supposed to possess occult powers in astrological or magical benefits in the Tantric traditions of the Indian religions. Traditionally such symbols are used in Eastern mysticism to balance the mind or focus it on spiritual concepts. The act of wearing, depicting, enacting and/or concentrating on a yantra is held to have spiritual or astrological or magical benefits in the Tantric traditions of the Indian religions.